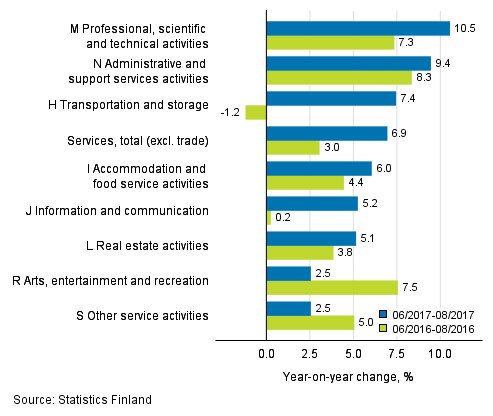 According to Statistics Finland, turnover in service industries grew by 6.9 per cent in June to August from the corresponding time of the year before. All main service industries grew from one year back. Professional, scientific and technical activities (+10.5%) and administrative and support service activities (+9.4%) developed strongest. Turnover grew most moderately in the industry of arts, entertainment and recreation activities, and in other service activities. Both industries grew by 2.5 per cent. Services are here examined exclusive of trade. Among the sub-industries of professional, scientific and technical activities, growth was most rapid for other professional, scientific and technical activities (+15.7%). The turnover of architectural and engineering activities went up by 12.3 per cent and that of advertising and market research activities by 6.8 per cent. Among the sub-industries of administrative and support service activities, employment activities (+15.2%) and renting and leasing activities (+13.2%) were in the lead. The turnover of security and investigation activities grew by just 2.6 per cent. Transportation and storage activities increased by 7.4 per cent year-on-year. Of its sub-industries, warehousing and support activities for transportation reached a growth of 8.9 per cent. The turnover of water transport increased by 6.3 per cent and that of road and railway transport by 5.4 per cent. The development in the main industry of other service activities was slowed down especially by the 11.2 per cent drop in the turnover of repair of computers and personal and household goods. The effects of the changes in the Tax Administration's self-assessed tax data have been analysed in Statistics Finland’s turnover indices. Based on the analyses, no significant changes for statistics production were observed in the value added tax reporting of enterprises. More about this under Changes in the periodic tax return data used in turnover indices. ISSN=1799-0998. August 2017. Helsinki: Statistics Finland [referred: 22.4.2019].